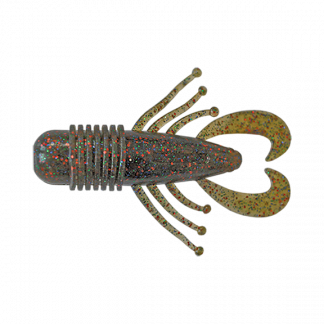 The Strike Pro Finesse Bug is a superb Creature Bait that can imitate a Prawn, Bass Yabby (Nipper), Yabby, Crab or Nymph. The Finesse Bugs feature a powerful secret shellfish formula that is ‘SCENT INFUSED’ into the plastic so there is no messy liquid in the bag but a superb scent that attracts fish and triggers them to strike. The Finesse Bugs also feature a smooth body with ribbing added in the body to increase Vibration and will also hold scent if applied, for a longer period of time. The design of the tail section has been done so you don’t need to trim the tail for the modern style of Jigheads that most anglers use today. The Feelers give a superb swaying action and the legs have weight balls added to the ends for added movement and attraction. They also come packed in a tray to eliminate any damage or twisting to the plastic so each plastic is 100% perfect to use straight away.